Alongside financial returns, the aim of our private equity and venture capital investments is to have a positive social and economic impact. Social and economic impact is manifested through job creation and the maintaining of existing employment as well as through the profitable growth and internationalisation of companies. The renewal of economic structures is an important dimension to our impact. Industrial renewal is the goal of our targeted investment programmes and a strategic objective for our investment operations. We develop the private equity and venture capital investment sector and market. Catalysing private and, particularly, international capital to boost the growth and internationalisation of Finnish companies furthers this aim while also channelling into the companies expertise in developing their business and valuable international networks. Finnish Industry Investment has in many cases played an important role in establishing a new private equity and venture capital fund and, correspondingly, in direct investments by sharing the risk with private investors while boosting the amount of venture capital to an internationally competitive level. For international investors, we offer a reliable and skilled local partnership. Through selective for-profit investments made hand-in-hand with private investors we ensure that capital resources are targeted at the most promising companies, in which their impact will be maximised. Private equity and venture capital investments, by their nature, produce returns and therefore from the viewpoint of public finances are a cost-effective way of stimulating economic growth. Each year we evaluate the social and economic impact of investments. The data from the 2014 financial statements of portfolio companies was available for the last evaluation we conducted. At the end of 2014 our investment portfolio comprised, directly and through funds, some 610 companies generating around 43,000 Finnish jobs. During the review period the companies in our portfolio created some 3,000 new jobs, representing approx. 8% annual growth. Over the same period employment in Finland declined overall by 0.4% (Source: Statistics Finland). An outstanding example of international growth gained through systematic and long-term R&D is Oulu-based Optomed Ltd, which produces an inexpensive and easy-to-use fundus camera. Used to photograph the back of the eye (i.e. the fundus), the product is a significant advance for eyecare, especially in developing countries. The company has found a global distribution partner for its product and its net sales grew by 50% in 2015 to €6.1m. We develop the Finnish venture capital and private equity market mainly by catalysing private and international capital into venture capital financing for Finnish growth companies. In 2015 a total of 8.6 times the amount invested by Finnish Industry Investment was channelled as private equity and venture capital investment into our portfolio funds. In our direct investments the catalysing factor was 6.8, and capital invested from abroad almost equalled the amount we invested. International capital accounts for a growing share of the investments made in Finland, and during the year a total of €113m in venture capital from abroad was invested in Finnish funds and companies through our networks. Most of the capital from abroad consisted of investments in funds. Co-established with Finnish pension institutions, the FoF Growth funds (FoF Growth and FoF Growth II) are funds-of-funds investing in Finnish private equity and venture capital funds. 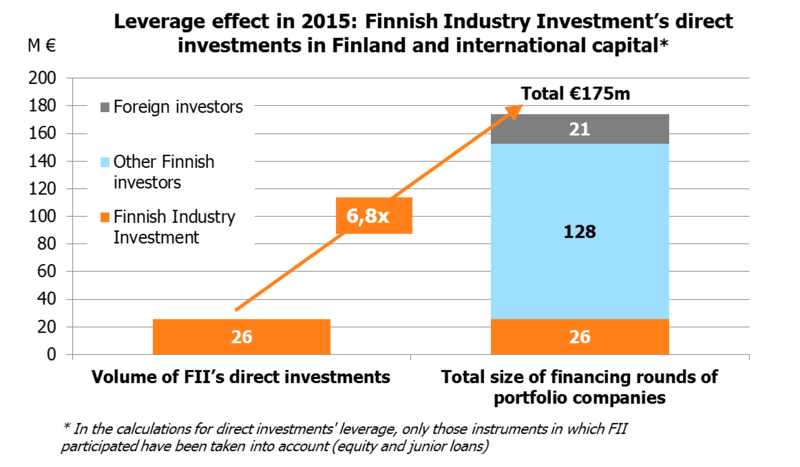 FoF Growth had invested in 11 Finnish funds at the end of 2013, when its investment period expired. The total capital invested in portfolio funds amounted to €835m, of which €230m came from investors abroad. At the end of 2014, the portfolio funds had some 100 companies in their investment portfolio generating annual net sales of over €800m and altogether 6,300 jobs. FoF Growth II started its investment operations at the start of 2014 and to date has made commitments amounting to €62.5m in five funds. The fund made three new investment commitments during 2015. Investment programmes are an important tool for focusing direct investments. In 2014 we launched the €100m Industrial Renewal programme aimed at strengthening Finland’s industrial renewal and competitiveness. The programme focuses on medium-sized Finnish enterprises and the companies serving them. The sectors that are strategic priorities for the programme are cleantech, bioeconomy, health technology and digitalisation. By the end of 2015 investments totalling €47m had been made in 17 companies under the auspices of the programme. The largest investments for the programme in 2015 were in Rauma Marine Constructions Oy, for continuation of the business operations of the Rauma shipyard, and in Kotkamills Oy, for modernisation of a paper machine for packing board production. In early 2015 we launched a new €25m investment programme aimed at attracting international investors and capital, as well as international expertise and networks, to Finland to promote the internationalisation of Finnish growth companies. The first two investments were made during 2015.